Paul Van Der Molen has been an avid music lover most of his life. The Van Der Molen home has always had a room dedicated to music. Many world-renowned pianists and theatre pipe organists have performed in concert there. A number of years ago when Paul was constructing his first music room a suggestion was offered as a joke that the room should be called "The Wheaton Fox". Fox was drawn from the movie chain of the same name while Wheaton was the name of the town in Illinois in which the Van Der Molen's lived. It wasn't long before the name found common use and today Paul and Linda affectionately refer to not only the Music Room but also on occasion their home as "The Wheaton Fox Studio". When Paul and Linda downsized their home to move into a smaller residence several years ago, the Wonder Morton was removed by the American Organ Institute and placed in storage were it is currently undergoing rebuilding by students enrolled in the educational program at the University of Oklahoma's American Organ Institute. Once rebuilt it is intended to be reinstalled in a former Loews Wonder Theater in the New York City area. Paul and Linda remain active in theater pipe organ and this site serves as an informational resource related to the Wheaton Fox Morton and the many that enjoyed it over the many years it was installed in the Van Der Molen home west of Chicago. 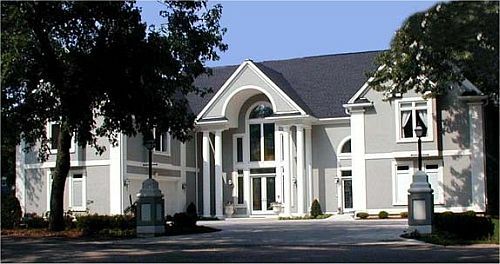 In 1998 when Paul and his wife Linda embarked on a major renovation of their home the Music Room was greatly expanded. The original Robert Morton Theatre Pipe Organ was expanded from 20 to 26 sets of pipes now located in two distinct chambers. The Morton-generic 3-manual console was replaced with a rare, highly decorated, 4-manual Wonder Morton console. A small performance stage was added along with a state-of-the-art digital projection system and complementary theatre surround sound system. 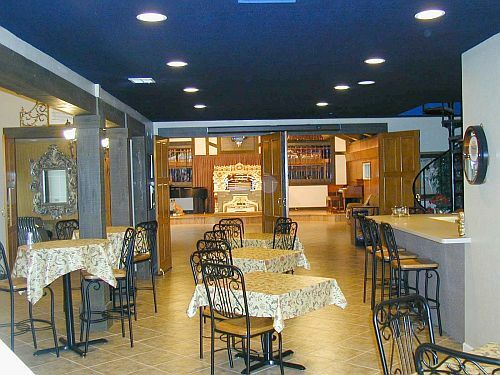 The Wheaton Café area at the rear of the Music Room provides accommodations for catering and food service. Paul and Linda routinely host numerous music groups that visit The Wheaton Fox. 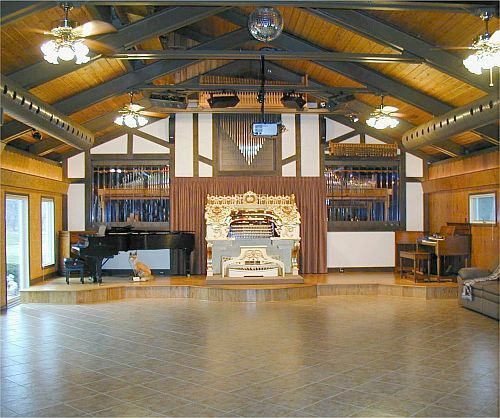 This view shows the Music Room's stage area in The Wheaton Fox. A 9' Steinway Grand Piano is to the left, the 4/26 Robert Morton Theatre Organ console is center stage, while a Hammond B-3 sits off to the right. Both organ chambers sit behind clear acrylic panels to allow visitors to see the many pipes of the instrument. The Main Chamber is located on the left behind the piano while the Solo chamber is to the right. The organ console moves in and out of a curtain-covered niche on a motorized platform. Above the console and behind the chimes is the Percussion chamber containing a Harp/Marimba and Chrysoglott. Above the chimes sits the Xylophone and above the Solo Chamber sits the Tuned Sleigh Bells. The small rectangle just below the Xylophone is the digital projector that can display silent films and other video programs on a screen that drops down above the console. Fred maintains a vigilant watch on the room from his favorite 'den' under the Steinway. 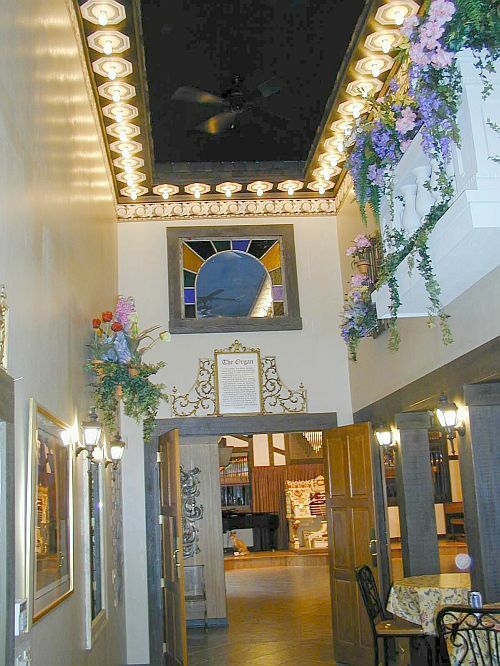 Click here for a tour of the Robert Morton Theatre Pipe Organ. From the stage a performer looks back to the sound and lighting control console (left) and out into the outdoor cafe area. Three sets of double doors allow the music room to be separated from the Wheaton Fox Café. 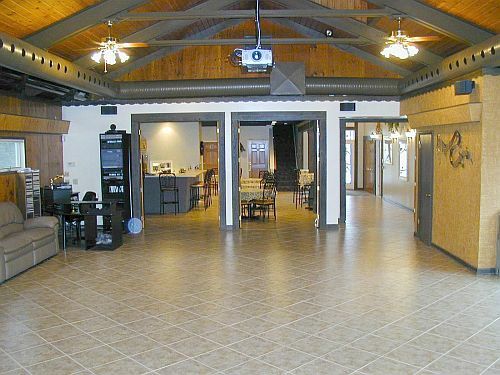 At the far rear are restrooms and stairs leading to comfortably detailed guest quarters for the performers located above the Wheaton Fox Café. The main house is along the right side. The central theme of the entryway to the Music Room is the Wheaton Fox Café. Here high walls give the illusion of an outdoor café building complete with a cedar-shake roof and blue skies. Several of the guest artist suite windows look out onto the Café sidewalk. The Wheaton Fox Café offers seating for several dozen 'patrons'. A kitchen area including gas stove, microwave, refrigerator, and dishwasher are along the right side of the café. of the remaining Loews Wonder Theaters in the New York City area. Design by: Robert E. Wilhelm, Jr.